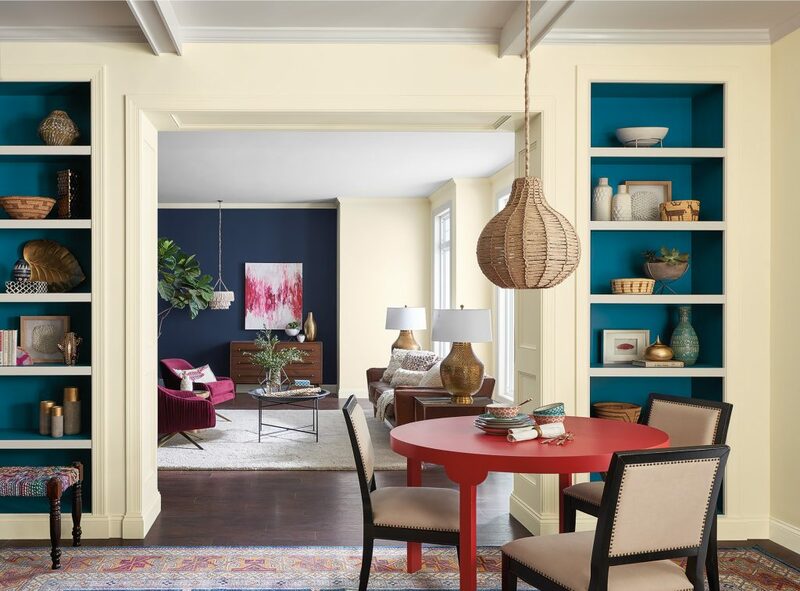 According to Sherwin-Williams, “2018 will embody the spirit of contemporary life.” The trend of 2018 will be moving away from white and towards moodier, bold hues. Tones like watery blue-greens, shades of black, and even bright yellows are becoming increasingly popular. 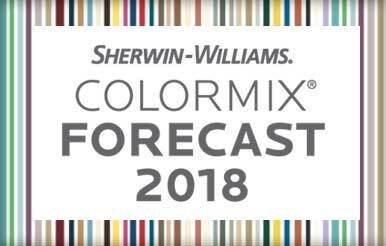 The Sherwin-Williams 2018 Colormix Color Forecast chose three beautiful color palettes that will be trending in 2018: Unity, Connectivity, and Sincerity. From high-definition yellow to vivid blues and greens, each of these pallets is uniquely inspired by the collective culture we live in. They will capture the mood of a year that is bound to be full of prosperity. Perfect for minimalism, meditation, and the Swedish concept of “Lagom”, which means “just enough”. 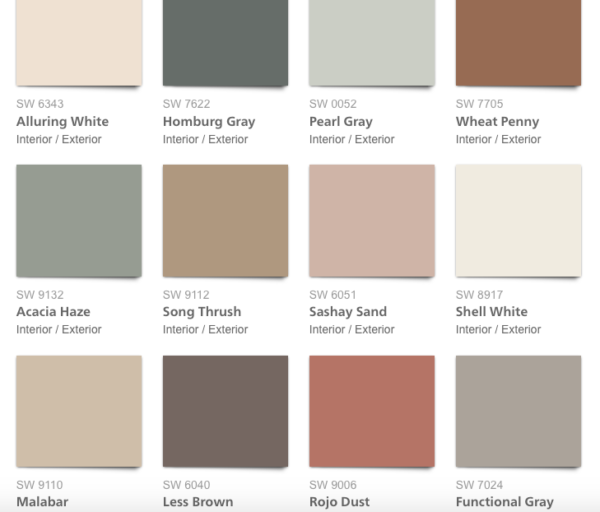 According to Sherwin-Williams, “the hushed tones of sincerity play out in sand, complex grays and hazy botanicals. There are no harsh lines, but rather, blending and fluid movements that create peace and space”. Sincerity is perfect for adding a calming atmosphere to any room. Try using this color to invite peace and quiet into your space! This palette is inspired by the nomadic spirit of constantly experiencing new places and cultures. They took influence from societies shift towards collectivism in everyday activities like ride-sharing and E-learning. With memorable pops of peacock color, animated fuchsia, and grounded browns, this color pallet will leave you feeling continuously inspired. The connectivity pallet is designed to embody the progressive high-tech culture that is filled with innovation and productivity. With colors like pixelated orange, violet, digital green, and high-definition yellow, this pallet can make any space feel immediately connected. 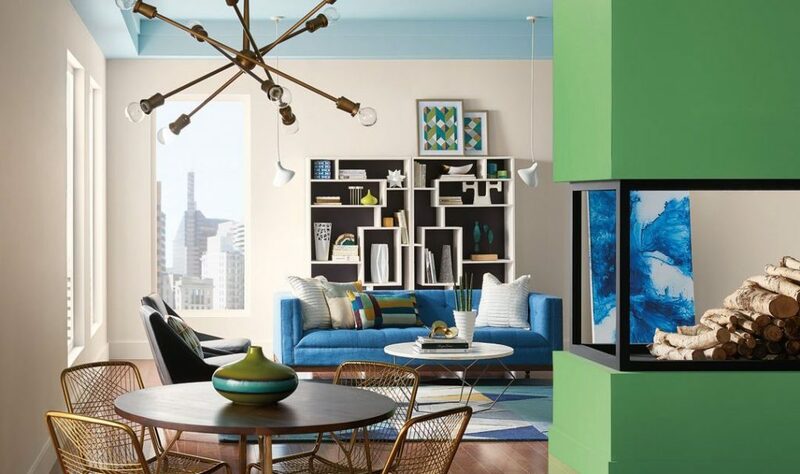 “A fusion of rich blue with jewel-toned green. Oceanside represents the growing desire for color that is both accessible and elusive. It is a complex and deep color that offers a sense of familiarity with a hint of the unknown”, says Sherrington Williams. Be the talk of the neighborhood with this eye-catching color. Oceanside is universally embraced by design styles from mid-century modern to Mediterranean and contemporary. It will make furniture pop and metallics shimmer beautifully. It can set a stage and create a focal point in any room. 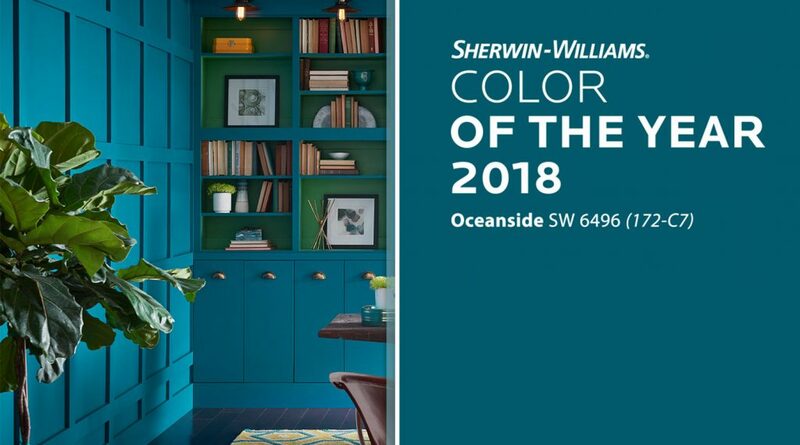 Oceanside’s versatility allows it to play an excellent counterpart to equally eye-catching colors like Exuberant Pink SW 6840 or Honey Bees SW 9018. 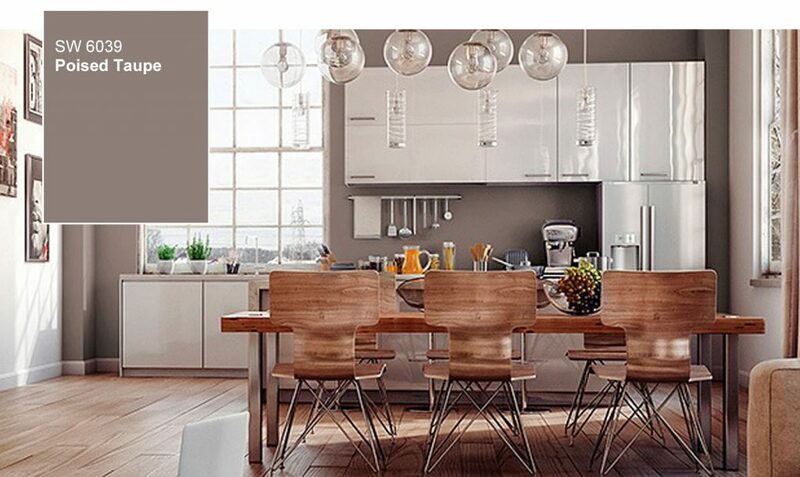 Alternatively, you can truly make it pop by contrasting against other light colors. It could also be played down softer next to other blue tones like Adrift SW 7608. There is even an app for Android and iOS for when you’re on the go. The app allows you to use features like color card scanning or the color matching tool. This tool allows you to pinpoint colors in your own photos to match with Sherwin-Williams products. Learn more by clicking here! A greenish-blue that is the perfect balance between light and dark. This would be a great color for your office, bedroom or bathroom. 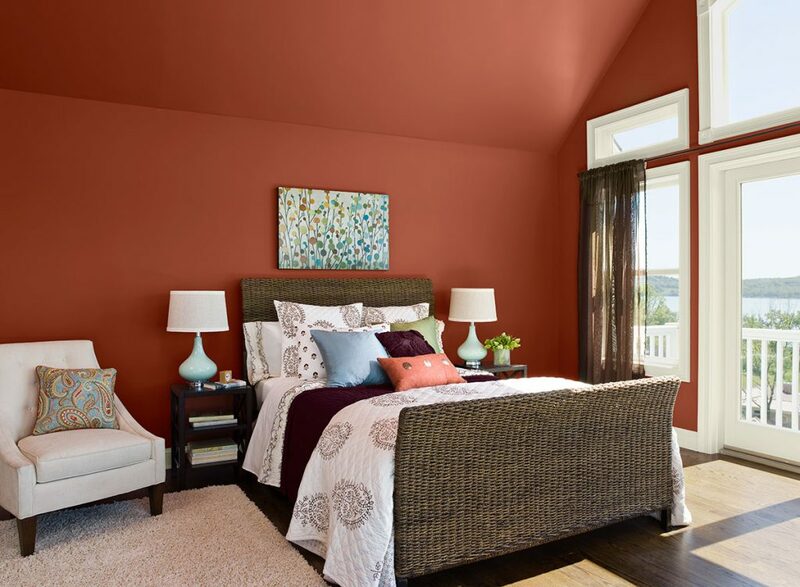 If you’re looking for a color that makes a bold statement, look no further than Benjamin Moore’s “Caliente”. It’s perfect for well-light accent walls, dining rooms, and front doors. This beautiful burnt orange color will spice up any bedroom, kitchen or bathroom. 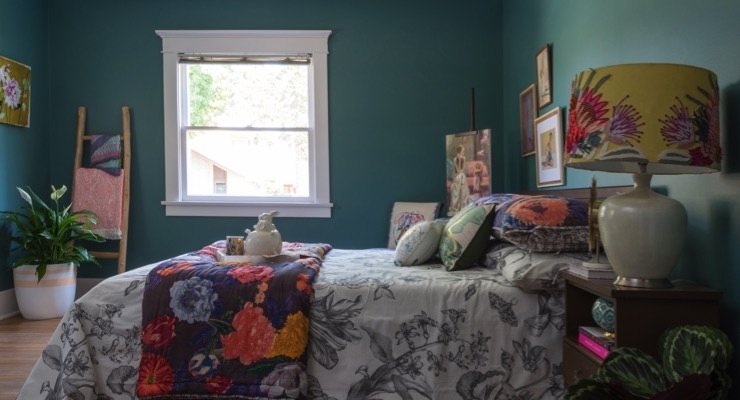 This was Sherwin Williams color of the year for 2017, but that doesn’t mean it isn’t here to stay. Many experts predict colorful neutrals will still be all the rage in 2018. 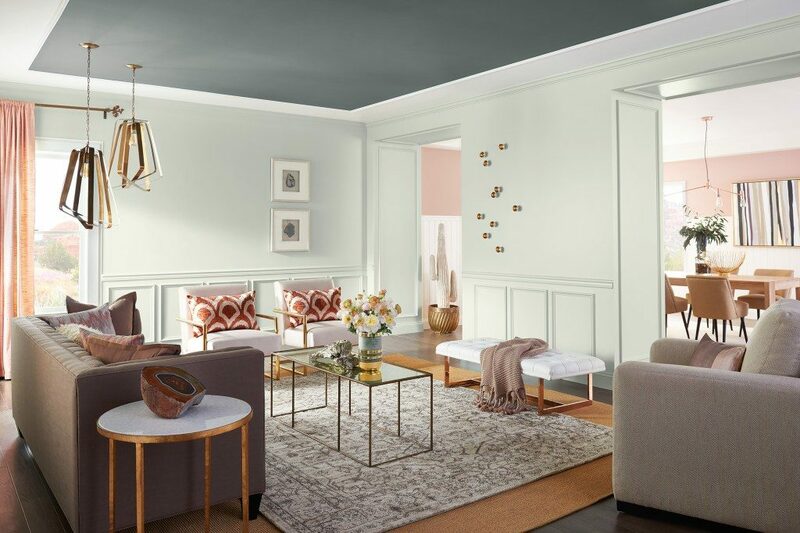 “It’s like a gray and brown had a baby,” Sue Walden, Sherwin Williams’ director of color marketing said. Furthermore, it brings lots of light into any room. The house is where you spend most of your time, so why not invest in it? Many experts will argue that the color of a room sets the overall tone and can say a lot about your personality. It can dictate things like what furniture you buy or the decor you choose to decorate with. We understand that choosing the right color for your home can be an overwhelming task. That’s why here at Truline we offer color design consulting services. With years of professional experience, we take the guessing and worry out of the selection process. We are committed to helping you find the perfect fit for your home and will work with you until you are 100% satisfied. We proudly use Sherwin-Williams, Dunn-Edwards, and Benjamin Moore paints. Let us walk you through your next project and make your vision a reality! Call us today at (619) 663-5878 or click below for your FREE estimate! We look forward to meeting all of your residential painting needs! 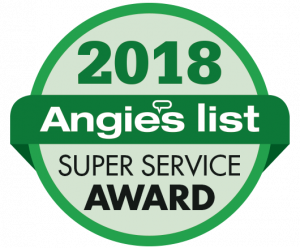 Let us show you why we are a “cut above the rest”! Great article! I love the Oceanside color, I had never seen this before. Keep it up! My wife and I are wanting to paint the living room and kitchen later this year, so thanks for sharing this. I like the idea of a “Caliente” because of the bold color. Having a dark red accent on the wall would be great for brightening the room I think. I couldn’t agree more, Derek. 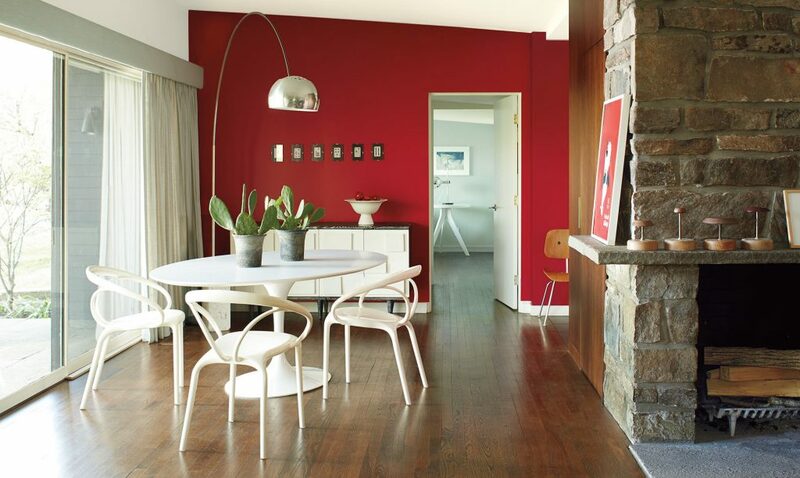 The dark red accent wall can do wonders for your kitchen without being too distracting. Best of luck on your painting project and thank you for reading! I really liked the oceanside color. It reminds me of the feathers of a peacock, and makes me feel energized, yet peaceful. I think this color would be great for an entertainment space, or even an office. I’ll actually be painting my room this summer, so I’ll definitely keep these trends in mind. That’s a great comparison. I often find myself feeling the same when I look at Oceanside. It’s such a versatile color. Thnak you for reading, Bethany! Good way of describing, and pleasant post to obtain data on the topic of my presentation topic, which i am going to deliver in university. Glad to hear you we’re able to use this information. Good luck on the presentation! 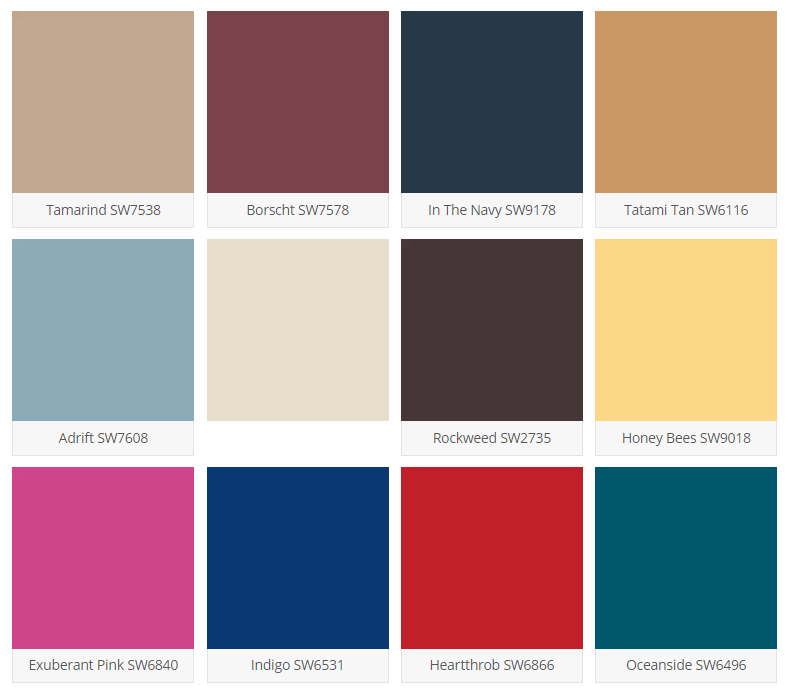 I love this list of trending interior paint options, especially the one about promoting unity and a nomadic spirit. The colors are bright but warm and would make a room feel really cozy. 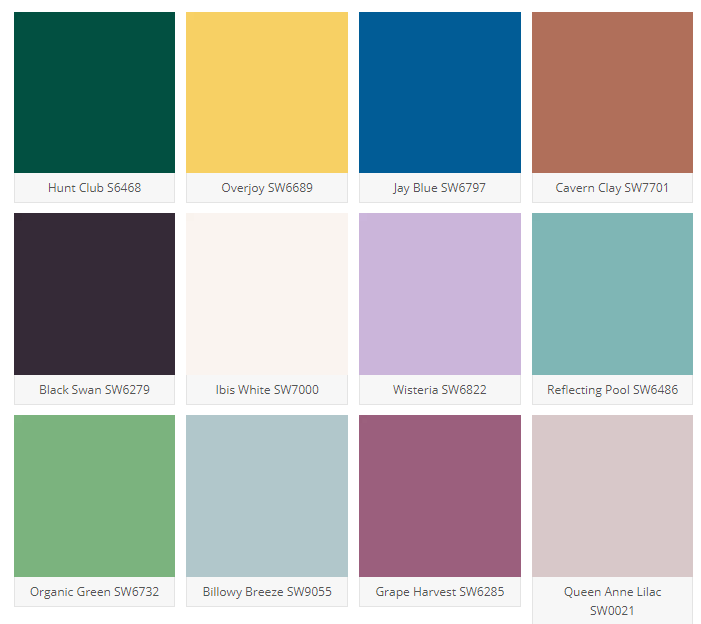 I want to repaint my home, so I will have to look into these colors more and test them out before I decide. Thank you Jenna! I highly recommend you look into these pallets when you repaint your home. They provide the perfect balance of warm and cozy. Thank you for reading! Very very impressive information. I must say all the tips are actually very helpful for many individuals like me who do not have much idea in the interior decor. Thanks for sharing. Thanks so much for reading Jon. I really appreciate it. Stay posted for more articles soon! My sister moved into her new apartment and she wants to have a nice serene color tone for the walls. It was explained here that sincere color tones play out in sand, complex grays and hazy botanicals. 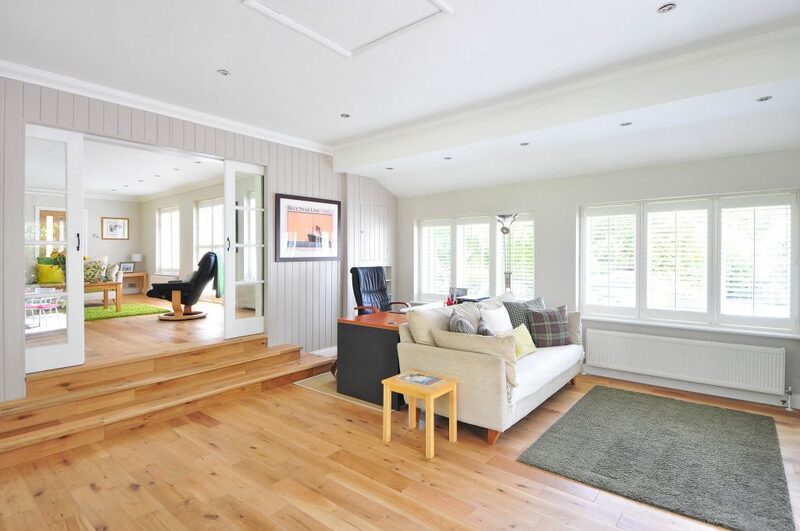 Moreover, it’s advisable to hire professionals for quality residential painting. Thanks for mentioning how animated fuchsia, and grounded browns will be able to make the residents feel inspired. My son has decided to take the freelance route and start his writing career. I know he needs every bit of inspiration and motivation he can get, so I will be happy to advise him to get his interiors painted with these colors. Great idea, Kit! Colors play such an important role in inspiration! I like the Salsa Dancing color you mentioned. Hiring a painter is a great idea. I will hire a professional to paint my basement. Thanks for sharing these color palettes! I’ve always been a fan of soft colors and ‘The Poised Taupe’ works perfectly for me but I’m trying to go bold this year, I’m going to try the connectivity palette, it’s bright and perky. I hope you can share more color palettes!